CDL A Training can come in many forms from free company sponsored programs to expensive truck driving schools like the one I went to. In between cost is community college which for many will be a great option. 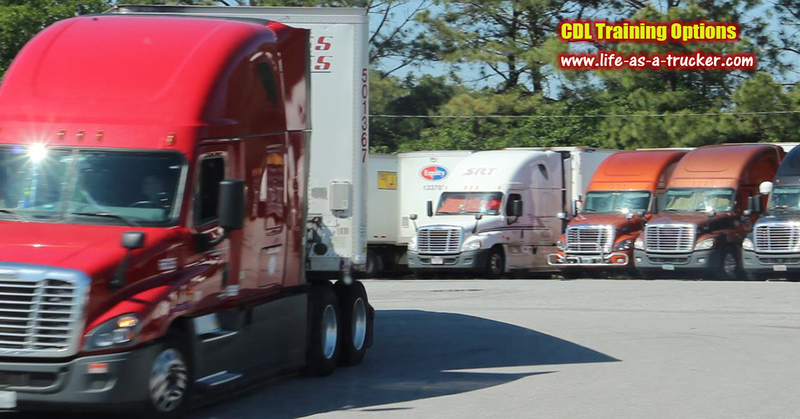 Question: Which is the best way of getting your CDL? Answer: There is no 1 best way. The best way depends on your specific situation and needs. I was anxious and ready to start trucking and I understood that my choice was not the cheapest route, but I saw a commercial on television and called. The class had just started and the next day, (with a lot of talking...) I was able to work my way in . 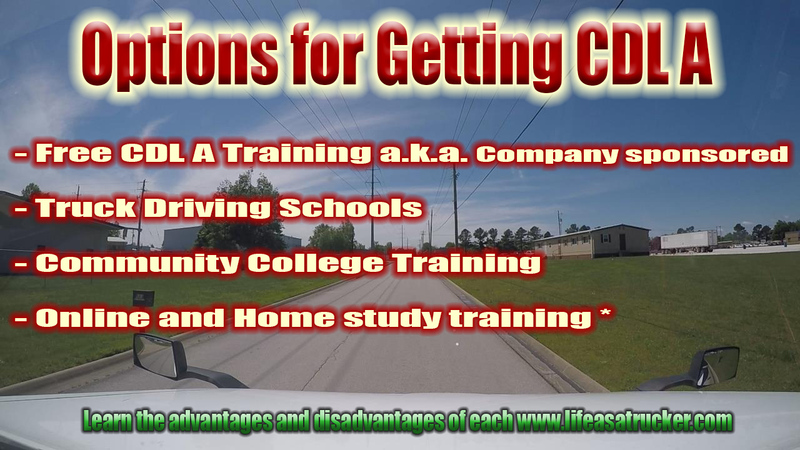 My advice you, read about the differences below to chose the best training option based on your situation and trucking job desired. You'll read some advantages and disadvantages of taking each route. If you or someone you know might benefit from this information like our page and remember...sharing is caring! Let's go over some terms and options for obtaining your CDL. Afterwards we will go into more detail about the training options. Accredited Trucking Schools - These are schools whose programs are evaluated for educational standards by government authorized organizations or agencies. PTDI - Professional Truck Driving Insititue. This is not a trucking school. This is an organization that evaluates trucking schools training programs for quality and safety. If the training program for commercial drivers license passes they certify that truck driving school. Community colleges can also be PTDI certified in addition to accredited. For more information about PTDI certification visit them. Community College CDL Training - Many of your neighborhood community colleges now provide truck driver training for obtaining your CDL. It should be an accredited school to insure you get the best training. See advantages and disadvantages at the link. Free CDL Training - This means that the company will train you without you having to seek financial aid or paying out of pocket. It's free with conditions and terms that apply. So it's not always free and it's not for everyone. See more details and Company Sponsored CDL training which is just another name for free CDL A Training. Company sponsored CDL Training - Company Sponsored Training is the same as Free CDL Training. The names are used interchangeably. See the advantages and disadvantages at the title link. Private Truck Driving Schools for CDL Training - This means it is not a state school or community college. Some could have affiliation with a number of trucking companies which you could choose from. Usually they specialize in only truck driver training and allow you to go to any trucking company of your choice. Some may also train heavy equipment operators or haulers. Private truck driving school is often the most expensive CDL training but in most cases the quickest way to a Class A. Check out the school you're thinking of attending for specific details. Note: These days, some private truck driving schools also provide training for specific companies. You might be able to choose from several companies to work for upon completion. Home Study Course - There are internet home CDL home study courses and such available to help you study to get your commercial driver's license. You can just as well get the CDL handbook from your local DMV and study it yourself, but some people like official programs I suppose. Also with some of these programs 1 benefit would be documentation stating you have passed test pertaining to the information. This may be useful to show to prospective company that will hire you or not. I am not sure. You could call them and ask. For both of these alternative methods you will need a tractor trailer to practice driving with. If you know someone in with a truck and trailer good for you. If not, that could be a challenge for the do it yourselfers. Other options for getting a truck to use, may be to hire someone to take you out on a tractor trailer and allow you to test with it. The next obstacle will be to find a company to hire you after getting your CDLs this way. Many will say their insurance requires the drivers they license have gone to truck driving school. Call around to the companies your interested in and see if they will hire you if your are considering getting your CDL at home. You may have to get experience some where else first and then go to that company. This is ok for some but for others, it is a lot to take in without a structured learning environment with instructors experienced in teaching. However, back in the day, there were no truck driving schools. Of course this is not back in the day. One of the best choices to get your CDL in my opinion? Community college to get your CDL. But that is your decision based on your situation. Do you have more questions or comments about the material on this page? Ask your questions. Please keep it on topic of this page. If you have a question that doesn't relate to this page, go to the correct page or the main ask a trucker page. Do not capitalize all of your letters. It will be deleted. Note: Some questions may be read in a video to be posted on the website. If you don't want your name revealed use an alias. Simply type in this box when ready. Your question will appear on a web page on the site if it is approved. Do not type it in all caps. To drive a large dump truck and pull a trailer which class CDL is required? I am trying to verify which class, A or B is required to drive a super dump truck and pull my skid steer behind it on a trailer? Want to do my road test in a automatic. Looking for a truck driving mentor to rent his dump truck for PTI and backing practice for me to take my final test.